We all know that Japan has some pretty advanced mobile phones. But it's not so widely recognised that networks also provide simpler versions for people not bothered about phones with everything on. 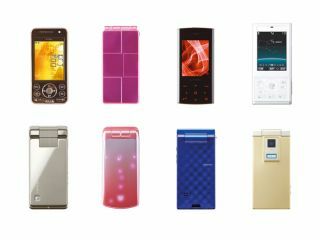 The latest such cut-down handsets from market-leader NTT DoCoMo can be found in the 3G FOMA 704i series , which was announced yesterday. Each should sell for around ¥20,000 (£81) with a contract. The phone most likely to win friends and influence people is the L704i, AKA LG's Chocolate phone. It comes with 3.6Mbit/s HSDPA for fast downloads. And it includes a GSM radio for overseas roaming - an increasingly common feature in non-GSM Japan. Other likely winners are the P704i, which has a technology that maker Panasonic calls Smart Flash for enhancing night-time photos. And the SH704i and D704i (from Sharp and Mitsubishi respectively), which include 1-seg digital TV tuners. Perhaps we should reconsider that party line about these being 'simple' handsets?